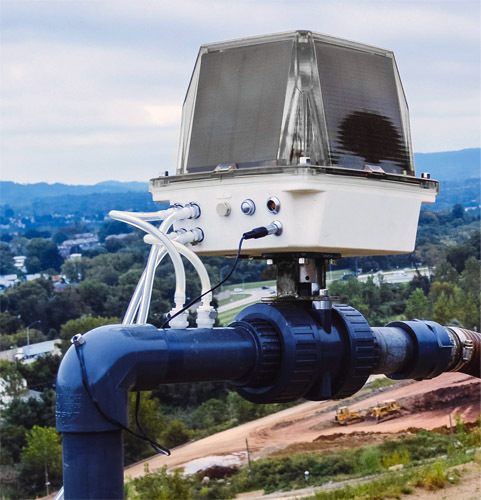 Apis Innovation develops autonomous sensor-control technology for landfill gas systems that aim to improve methane collection and reduce operating risks. Our system provides the most frequent data collection at the lowest price when compared to competitive products. Apis Innovation's Swarm Wellhead autonomously samples and adjusts landfill gas wells with the goal of increasing methane extraction. Each device measures methane, carbon dioxide, oxygen, static pressure, flow, temperature, and valve position. A high-torque valve actuator adjusts the well per a unique control algorithm, and a solar-battery power system ensures the Swarm Wellhead stays online. A power efficient communication network enables the device to collect minute by minute data which guarantees that the gas well is properly tuned, 100% of the time. Data is relayed to a cloud server where it can be visualized through Apis Innovation's dashboard.